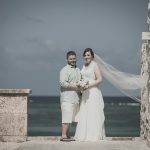 Today we shared a beautiful day with Karlee and James’ down at the beautiful Occidental Grand Xcaret Resort in the Mayan Riviera, Mexico. The day started out in the brides luxurious Royal Club suite where she was getting ready with all of her girls and her mom. Once Karlee was ready her wedding cordinator Luz (who was absolutely fantastic) picked all of us up in a limo golf cart and rushed us off to the ocean’s shore where the ceremony was being held. 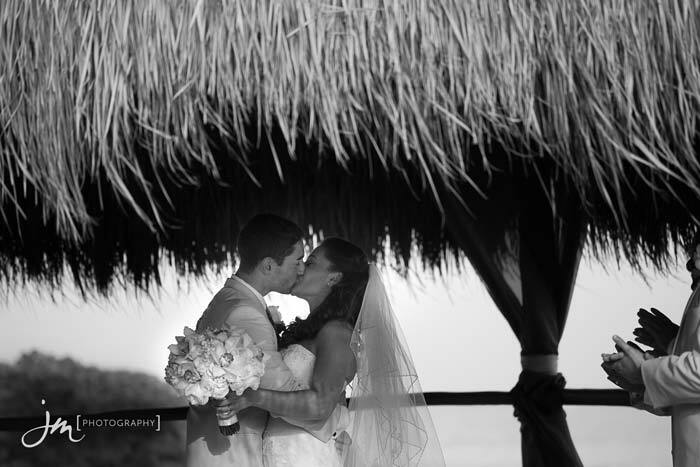 The ceremony was held in the resorts wedding hut that is located at the foot of the Caribbean Sea, as the sun was setting. Karlee walked down the aisle with her father in her beautiful wedding gown that she found at David’s Bridal and was designed by Melissa Sweet. After a short ceremony Luz and her wedding team had fresh champagne ready for all the guests to toast the newly wed couple. With no time to spare and the sun quickly disappearing over the horizon we were off to capture their formal pictures. The first stop was a set of Mayan ruins that were dedicated to the Mayan fertility goddess. All the locals at the resort joked that it was the temple where two people would go in and three would come out. At the Mayan temple we captured all the group photos and then we visited four other locations across the property. The final location was in the Occidental’s grande main lobby where we created a composited photo that will be built from 27 different shots that we started capturing at 5:00 AM earlier that morning. The slideshow above is our studio’s same day reception slideshow. This is where we edit a selection of the photos taken at their wedding, create a slideshow and present it at their reception. 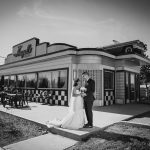 The photos from Karlee and James’ wedding will take 6 to 8 weeks to edit and once they are finished their viewing session they will be released to the following gallery for a limited time. Sign up today so you can be notified once the photos have been released online. From the gallery you will be able to view, favourite and order our beautiful print products. Check out our albums here.